The client provided solutions for high-temperature insulation and sealing needs and is based out of Lynn, Massachusetts, USA. The client had provided design, prototyping, stocking, kitting, and assembly services to global players. Working with appliances, HVAC, hearth, power generation, marine, refractory contractors, investment casting, fuel cell, and marine industries, etc. the client has earned a name for itself in extensive fabrication capabilities. This includes CNC machining, water jetting, laminating, slitting, die cutting, casting, laminating, and vacuum forming. As a service-oriented enterprise, the client has been a favorite with its customers for many years now. The client needed help with the creation of SolidWorks models from PDF and photographs which was a challenge as photographs did not provide clarity on the materials used and neither was the texture clearly seen. The client needed an engineering service provider with experience in providing file conversion as well as drafting of engineering drawings. The task involved creating drawing sets for several insulating equipment. The condition was to match the exact surface coating for the equipment as required. Our team identified the challenge and strategized a communication network with the client by understanding the requirement and taking their inputs at every stage of the drawing creation. We received PDF files and photos of the color and texture needed to be followed in the drawings. It consisted ten sets of drawing with each set about eight drawings. O2I assigned the task to a team of three that included skilled drafters, a quality analyst and an accounts manager to oversee the project. The client was pleased with the output we provided in 3D and 2D SolidWorks files because the surface finishing of drawings matched with the existing photographs provided by them. Our skilled drafters successfully upheld the promise to deliver highly detailed and accurate drawings of insulating equipment. Outsource2india is a renowned name in the 3D modeling and drafting, and ideation services industry. Our 19-year-old tradition of serving clients with quality services and best experience makes us the first choice across competitive markets worldwide. We are well-known for bringing ideas to life with skilled drafters providing highly detailed and accurate drawings at an affordable price. 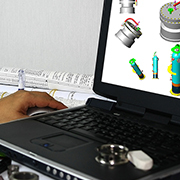 From surface modeling to detailed exploded views for a better understanding of heavy machinery, our proficiency in 2D to 3D modeling services has led to creation of powerful drawings. With experienced staff and industry's latest software, we continue to bring our clients better values through latest innovation. Be it for marketing, brand building, or visualization purposes, we deliver precise 3D modeling services to meet varied requirements. We are leading providers of other top solutions such as 3D modeling and mechanical drafting, 2D drafting services, CAD conversion services and more. Contact us today to understand how we can successfully carry your digitization projects.